Paris Descartes University (French: Université Paris 5 René Descartes), also known as Paris V, is a French public research university located in Paris. It is one of the inheritors of the University of Paris (often referred as the Sorbonne), which was split into multiple separate institutions in 1970. Paris Descartes is a member of the Sorbonne Paris Cité University (USPC) group. It was established as a multidisciplinary university "of humanities and health sciences" ("des Sciences de l’Homme et de la Santé". It focuses in the areas of medical sciences, biomedical sciences, law, computer science, economics and psychology. Its main campus is in the historic École de Chirurgie in the 6th arrondissement of Paris. The historic University of Paris (French: Université de Paris) first appeared in the second half of the 12th century, but was divided into thirteen universities, managed by a common rectorate, the Chancellerie des Universités de Paris, after the student protests of the French May. 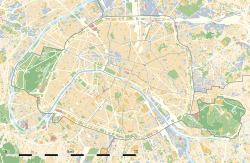 Descartes University has ten campuses in Paris. Its headquarters are centered on the "Collège de chirurgie", which was built in place of the "Collège de Bourgogne", in the Quartier latin, on the rue des Écoles. The teaching facilities and the research laboratories are housed in the Saints-Pères university center, as far as the medical school and the social sciences school are concerned. The refurbished Henri-Piéron center contains the school of psychology, whereas the Law school is located in Malakoff. The dentistry school is located in Montrouge. The undergraduate program of Paris Descartes is selective, with an acceptance rate of 11%. Admission to the second year of the university's master programs is selective as well, some of these programs admitting only 1.7% of applicants which can represent 25 students by programs. The University Paris V has signed over 150 conventions with foreign universities across five continents, including Manchester, Warwick, Copenhagen, Rome, Madrid, Rotterdam, Helsinki, Stockholm or Ghent. The university focuses on medical sciences (medicine, dental medicine, pharmacy, psychology), biomedical sciences (cellular and molecular biology, biochemistry, chemistry, biomedical physics), social sciences (sociology, anthropology, linguistics, demographics, science of education), mathematics, computer science and law (information technology law, business law, tax law, public law, private law...). 201–250 (1st in France) in Psychology. In Law, in 2016/17, it was not ranked among the top 10 of France of Eduniversal rankings. ^ "Nos universités partenaires / Étudiants partants/Outgoing students / INTERNATIONAL / Droit - Faculte de Droit - Universite Paris Descartes". ^ "Subject Ranking 2015-2016: clinical, pre-clinical and health top 100". 13 October 2015.